I'm not an astronomer by any stretch of the word, but I do hold a special fondness for the night sky and for anyone, amateur or otherwise, who studies it. Here are some of my fondest moments: My dad, ushering us outside, watch held up high, counting down the seconds until a satellite streaks overhead. The first one to spot it won - though the prize, a dim feeling that you knew the universe best, had communed with it somehow - was intangible. Laying with my sister in the middle of the road (something our dad didn't entirely approve of) and watching the Perseid meteor shower on an August night, counting shooting stars (the goal: over a hundred), getting scared out of our minds when sounds came from the nearby underbrush. Listening to my dad recount the pure wonder of watching the moon landing on television. So, the upcoming "Great American Eclipse" on August 21, 2017, which, as it happens, is also our first wedding anniversary, is something I expect to add to that litany of astronomical wonders I hold dear. 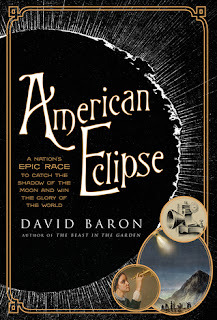 However, I don't really know much about eclipses, and I refuse to show up to a party unprepared, which is how I ended up reading American Eclipse by David Baron. I felt fully immersed in the Victorian setting, which, I found, I didn't know as much about as I thought I did! I had no idea what the average person's perception of science was, how people of different classes traveled long distances, how newspapers functioned, all of it! I was surprised by Thomas Edison's involvement and reputation among scientists and truly enjoyed the descriptions of the west. I might even give a Western a chance - there's just something appealing about it. This is one of the most informative books I've read in a long time. Even if you're not an umbraphile (a person who loves and chases solar eclipses), this book is a well-written and fascinating glimpse into a formative period of American history.